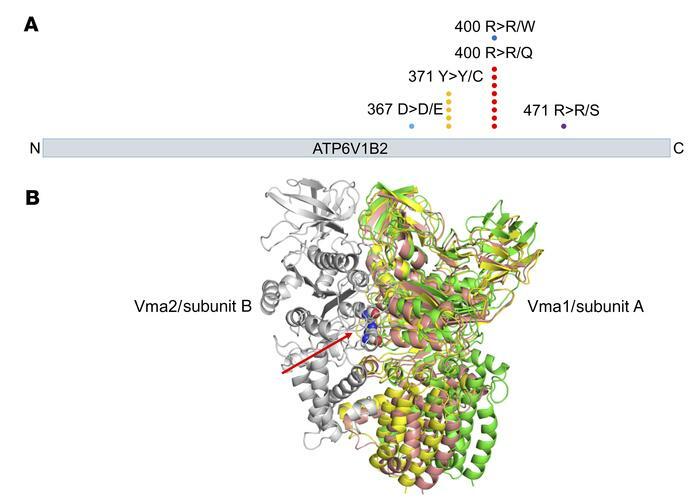 Graphical display and 3D modeling of FL-associated ATP6V1B2 (v-ATPase) mutations. (A) ATP6V1B2 mutations at known hotspots (p.Y371Y>C and p.R400R>Q) and the mutations identified in this study are indicated. (B) 3D model of yeast v-ATPase based on electron microscopy data published by Zhao et al. (32). The location of yeast amino acid residues corresponding to the human ATP6V1B2 hotspot mutations p.Y371Y>C and p.R400R>Q are indicated by the red arrow. The mutations are located in a region of yeast Vma2/v-ATPase subunit B, which is involved in the ability of the complex to adopt different functional states (green: open; pink: loose; yellow: tight; all 3 states are superimposed in this figure).